Ask any bright eyed and idealistic fourth year optometry student where they want to practice when they get out of school. Nearly all of them will say anything but a corporate practice. In this article, corporate optometrist refers to an OD employed by a corporation, not a leasing OD. Corporate optometry has a reputation in some circles, some of it deserved and some of it not. Be it from “old school” optometrists or just a general fear of anything WalMart related, corporate optometry suffers from a bad reputation in optometry school and beyond. You’ll see too many patients. The store managers only care about making more money. You’ll have to work evenings and weekends. You can’t increase your income. You can’t practice full scope optometry. 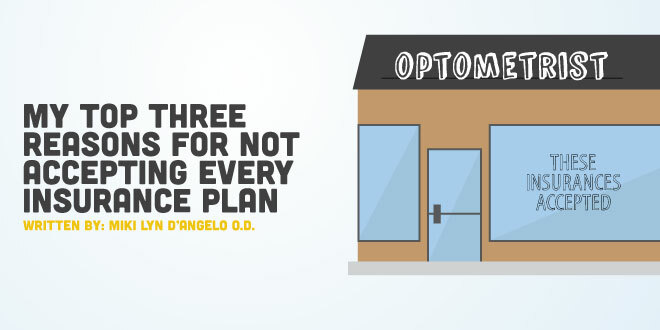 These are just some of the statements you’ll hear if you ask certain OD’s about corporate optometry. Some of these may be true, some of them are exaggerated, and some of them are downright false. There is a certain aura of negativity associated with corporate optometry, and undoubtedly, OD’s can be a negative bunch. However, I will share with you the many positives of being a corporate OD. 1) It provides a steady, and attractive paycheck. Many people choose to work in medical professions because of financial stability, and being a corporate optometrist is no exception. Starting salaries of employed corporate OD’s are strong and continue to grow. While salaries can vary depending on the employer, region of the country, and unfortunately, even gender, you will generally make more right out of school as a corporate OD than in any other modality. 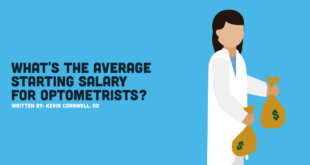 Review of Optometry has income surveys that come out every year, but they can be a little unreliable when it comes to corporate salaries because of low participation in the survey. Websites like glassdoor.com and salary.com will give you a better idea of how much a corporate OD can make in your region. Financially, being a corporate OD will start you out on a higher financial floor than in any other modality, but the highest financial ceiling can be reached as a self-employed OD. Floors, by definition, provide more stability and a solid foundation to grow on, and for some people that’s the most important thing. 2) You CAN make more money. Despite not having as high of a ceiling as a self-employed OD, you can make substantially more money than your starting salary if you’re savvy about it. Most corporations give yearly raises to their OD’s, which is great because it just makes that floor even higher. But if you’re proactive within the company, you have the potential to make much more money than just a yearly cost of living raise. Many corporations have positions for OD’s in training and management. The fact is, many corporate optometrists do not know about these positions or how to get them. In my experience, all you have to do is show some interest and ask an OD who is well established within the company. They can tell you about any advanced positions and how to pursue them. Sometimes, just showing some interest is all it takes. In the end, you can make more money as a corporate OD in many of the same ways you can as a self-employed OD: be productive, provide great customer service, and find ways to improve the bottom line. Here is a great article on the subject from Inc. magazine. 3) Treat whatever you want…or don’t. A corporate optometrist is still an optometrist. They can treat anything and everything within their scope of practice and state law. Eye disease does not discriminate between practice modalities. So if you want to monitor a patient for glaucoma or macular degeneration, and your state allows it, go right ahead! Corporations bill and code just like every other practice. If you don’t feel comfortable treating something, you can refer it out. I know OD’s that will refer out anyone with an intraocular pressure over 20 and other OD’s who are comfortable treating and managing glaucoma patients. Being a corporate OD allows you to see a very diverse group of patients, which means you will be able to see, and treat, as much as you like. 4) Truly leave your work at home. Some OD’s live and breathe optometry. They think about it day and night. They take more CE than their state requires just because they can. Being a corporate OD would be great for these people because they can see patients all they want during the day, and then immerse themselves into any optometry related activities when they get home. Be it reading the latest journals, taking online CE, or just looking at Google images of various disease states, the optometric world is their oyster. That’s because corporate OD’s do not have to stress about practice management after hours. They can learn more about their craft rather than looking into the intricacies of ICD-10 coding. There are other OD’s who love their job but would rather focus on their family or anything other than optometry when they get home. They can spend time with their kids or binge watch something on Netflix. 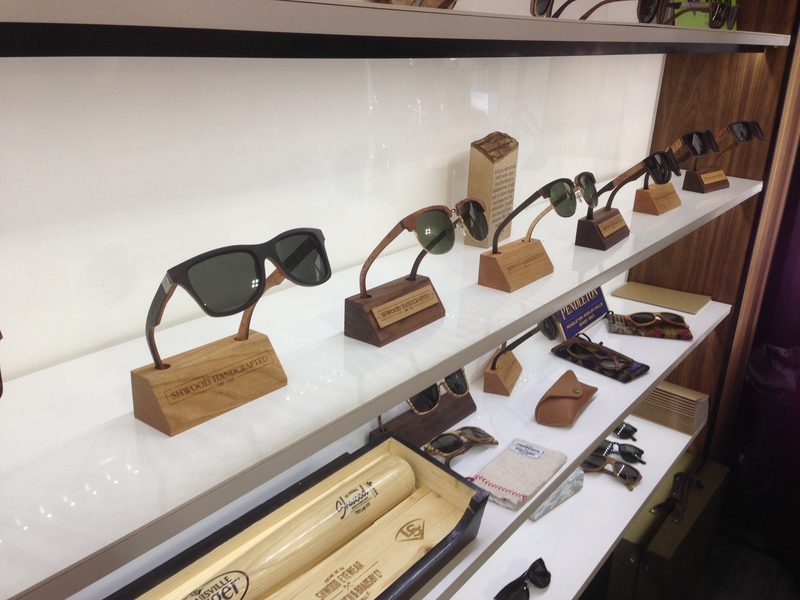 Corporate optometry can also facilitate this type of lifestyle. 5) Take time to learn the business. Many private practice OD’s have told me that private practice just isn’t for everybody. 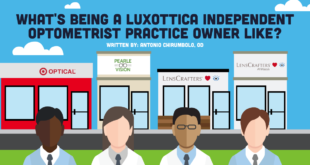 Some optometrists do not do well running a business and have little to no interest in it. Other OD’s just need to learn the ropes a little. This is where being a corporate OD would be a good option. Many corporate chains are huge, sometimes having hundreds of locations across the country. They know what they’re doing when it comes to business. Why not learn from them by being in the trenches and seeing what they do and don’t do well? Time spent working as a corporate OD can be very valuable if you want to learn how a business works. Instead of just sitting back and griping about the industry, be proactive and learn about the business. Find out why patients keep coming back to corporate practices (hint: it’s not just the prices). Bottom line: Being a savvy and proactive corporate OD allows you to practice full scope optometry, receive a steady (and almost always increasing) paycheck, and provides ample opportunities to get ahead in corporate or private practice for those who are willing to put in the work. Sounds like the best job ever to me. I work as a full time corporate OD and enjoy spending time with my family along with watching and playing basketball and football. Long time die hard Knicks and Giants fan. Also love reading, writing and talking about all things finance related. Connect with me and read my financial posts geared towards young OD's at thebrokeprofessional.com. Great article offering a different insight into our profession. Thanks Michael. The thing I love most about optometry is that there are many avenues to find success. 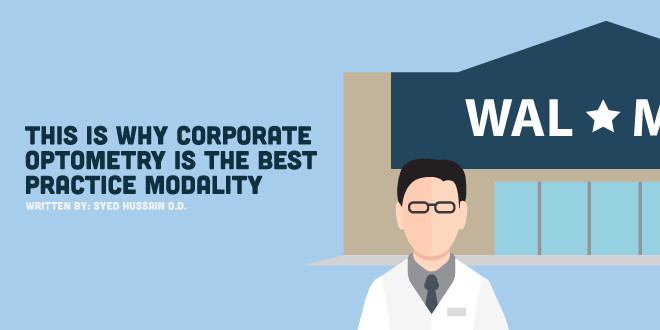 Be it private or group practice, academia, corporate, leasing, VA, specializations etc., everyone should find and focus on the modality that they are most happy with. Love it. Can you expand on the cliffhanger “Find out why patients keep coming back to corporate practices (hint: it’s not just the prices)?” What is it? Consistency in service? Availability for same day or night/weekend exam? I’m curious. The article focused on pros for the OD, but what are pros for the patient? Hey Bruce. Great question. I would say convenience is the main benefit for the patient. Most corporate practices are open after many patients get off work and on weekends. Also, corporate practices usually accept a wide variety of insurance plans. It might be worthwhile to survey patients to drill down and really find out why. Thanks for the comment.